Custom designed for your precious Apple Watch 38mm/42mm Series 1 /Series 2 / Series 3, this Milanese Stainless Steel Watch Band features a combination of functionality and style. 1. 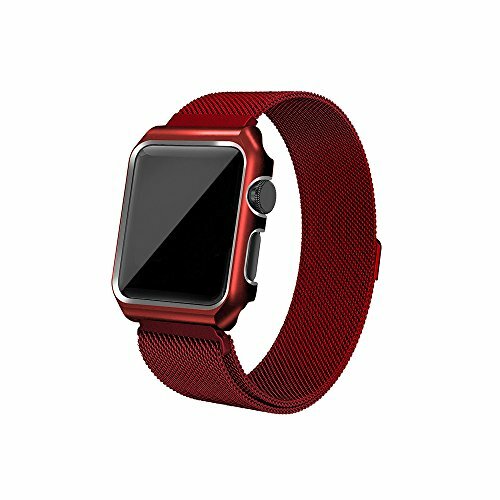 Personalized Your Apple Watch 38mm/42mm Series 1 Series 2 Series 3 with this refined replacement stainless steel wrist band with Milanese loop and Metallic bumper case. 2. Band comes with Watch Lugs on both ends, which locks onto Apple Watch Band Interface precisely and securely. Easy and direct installation and removal. 3. Unique magnet clasp design, no buckle needed, just stick and lock your watch band easily. 4. Woven on specialized machines, the smooth stainless steel mesh wraps fluidly around your wrist. And because it's fully magnetic, the Milanese Loop is infinitely adjustable, ensuring a perfect fit, easily to take on / remove, safe & fashion. 5. Flexible stainless steel mesh with adjustable Milanese Loop for comfortable day to day wear. 6. Fits 6"-9" (155mm-230mm) wrist. SIZE: There are two sizes 38MM and 42MM, please check your Apple watch size first then buy. METAL PROTECTIVE CASE: The case provides ultimate protection from scratches for your precious apple watch, ensures it in steady and secure. Advantage: Easy to Installation and replace.A very premium look,comfortable,breathable ,that ekes elegance and simplicity in its design. Compatible: Perfectly fit for Apple Watch Series 3 Series 2 Series 1 Sport & Edition 38MM&42MM, Apple Watch Nike+ all version model. SERVICE: 1 YEAR WARRANTY SUPPORT: Your satisfaction is always our goal, if your band has any quality issues, please kindly let us know and we will send you a replacement or refund you. If you have any questions about this product by AHXLL, contact us by completing and submitting the form below. If you are looking for a specif part number, please include it with your message.